Most studies that qualify for the expedited review process. Studies (regardless of review path) that have completed subject intervention/interaction and in which activity is limited to either final analysis of identifiable data/biospecimens or involve accessing follow-up clinical data from procedures that subjects undergo as part of clinical care. Remember: Studies qualifying for expedited review must be of no more than minimal risk and meet one of the OHRP Expedited Review Categories. Eliminating continuing review for qualifying minimal-risk research reduces administrative burden for both the study team and IRB staff without impact to the human subjects. 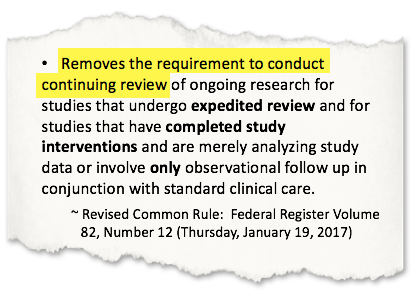 For existing expedited studies that are approved on or before January 20, 2019 and for full board studies that no longer involve subject intervention/interaction, the U-M IRBs will evaluate the need for continuing review at the time of the next amendment or scheduled continuing review (SCR) submission. Do not file an amendment only to convert an existing project to a "No CR" status. Terminate the project once it ends, or when personal identifiers are removed from the data/biospecimens and all codes and keys are destroyed. In the absence of the SCR process for qualified expedited studies, U-M will implement an automated annual email in the eResearch Regulatory Management (eRRM) system reminding the study team of these responsibilities. The system email will be sent prior to the anniversary approval date for the study. U-M IRBs may re-evaluate its CR/No CR decision for a project depending on the type of change(s) proposed in an amendment (e.g., protocol change that increases subject risk), or as an outcome of the IRB's review of Adverse Events or ORIOs. A new Termination Report submission option in the HUM workspace will allow the Principal Investigator (PI) or Faculty Advisor (for studies where a student serves as the PI) to close projects upon completion of the research. Previously, study termination was initiated through the SCR process, which has caused some confusion per study teams' feedback. 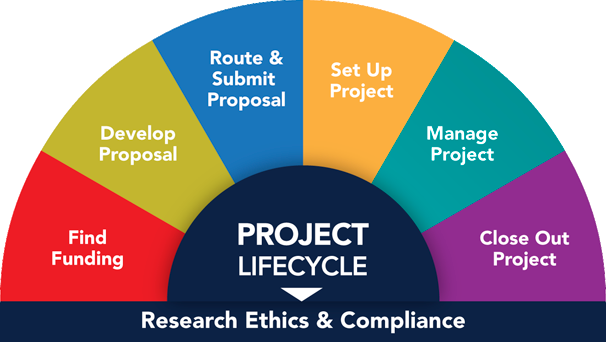 Offering a separate termination process simplifies and clarifies both the continuing review and project closure functions going forward. For convenience, the Termination Report option also will be available for exempt studies. U-MIC Presentation: Continuing Review Changes Under the Revised Common Rule (2018) [Download] Summary of the changes to the Continuing Review process under the proposed revised Common Rule.